LG starts rolling out the Android Pie update on LG G7 ThinQ. The update is a stable Pie build and soon will roll out via OTA for all users. Android Pie update for LG G7 ThinQ comes with a build number V20c and available for Korean variant G710N. You can Update LG G7 ThinQ to Android 9 Pie manually by following the below guide on How to Download and Install LG G7 ThinQ Android Pie Update. The Pie update for LG G7 ThinQ is a stable build which brings the January 2019 security patch. Here we share the LG G7 ThinQ Android Pie KDZ file which can be flashed using LG UP. Follow below guide to Download LG G7 ThinQ Android 9 Pie OTA Update and install it manually. The LG G7 ThinQ Stable Android 9 Pie features a new Digital Wellbeing dashboard, gesture-based navigation system, AI-enhanced improvements to the UI, Recent App Switcher, new Adaptive features (adaptive battery and brightness and January 2019 security patch. Download and Install LG G7 ThinQ Android Pie KDZ from below. This method will work only on LG G7 ThinQ variants. First, download the LGUP Tool and LG G7 ThinQ Pie KDZ ROM from above and extract it. Install the LGUP on your PC. Launch LG UP tool via Uppercut by double-clicking on the ‘UPPERCUT_1.0.0.0.exe’ file. Now in LGUP, click on Upgrade option choose the file’s path and locate the KDZ file and select it. Done! You have successfully Update LG G7 ThinQ to Pie. 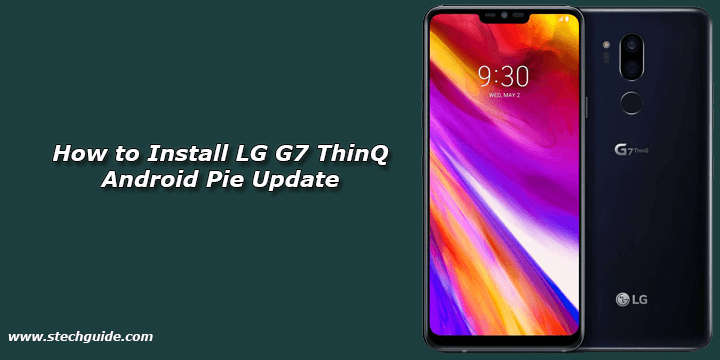 So this the complete guide to Download and Install LG G7 ThinQ Android Pie OTA Update manually. If you have any doubts comments below. Let us know your experience if you receive the update. Stay connected with us via Facebook, Twitter, and Google Plus to read more such helpful posts.